Vienna & Chicago, Friends or Foes? 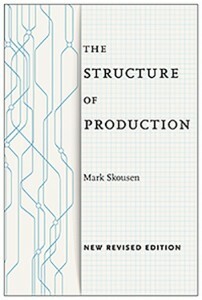 Mark Skousen, The Structure of Production. New York University Press. Third revised edition, 2015, 402 pages. $26 paperback. Available on Kindle. Quarterly data for Gross Output can be found at the BEA site here. For Skousen’s latest quarterly report on GO, see this. In 2014, the U. S. government adopted a new quarterly statistic called gross output (GO), the most significance advance in national income accounting since gross domestic product (GDP) was developed in the 1940s. The announcement comes as a triumph for Mark Skousen, who advocated GO twenty-five years ago as an essential macroeconomic tool and a better way to measure the economy and the business cycle. Now it has become an official statistic issued quarterly by the Bureau of Economic Analysis at the U. S. Department of Commerce. Since the announcement, Gross Output has been the subject of editorials in the Wall Street Journal, Barron’s, and other financial publications, analyzed in the Eastern Economic Journal, and is now being included in leading economics textbooks, such as Roger Leroy Miller’s new 18th edition of Economics Today. Economists are now producing GO data for other countries, including the UK and Argentina. 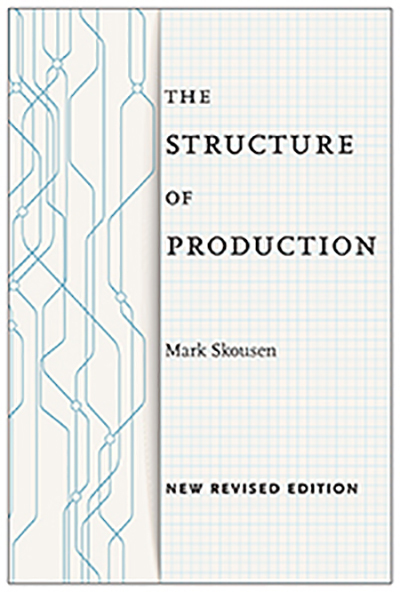 In this third printing of Structure of Production, Skousen shows why GO is a more accurate and comprehensive measure of the economy because it includes business-to-business (B2B) transactions that move the supply chain along to final use. 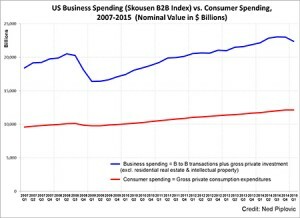 (GDP measures the value of finished goods and services only, and omits most B2B activity.) GO is an attempt to measure spending at all stages of production. MARK SKOUSEN is a Presidential Fellow at Chapman University in California. He has taught economics and finance at Columbia Business School, and is a former economic analyst for the Central Intelligence Agency. He received his Ph. D. in economics at George Washington University (1977). He is the editor-in-chief of the investment newsletter Forecasts & Strategies, and author of several books, including The Making of Modern Economics. To interview Dr. Mark Skousen or arrange a lecture, contact him at mskousen@chapman.edu, or Valerie Durham, Media Relations, 410-570-0535, or email her at vdurham@skousenpub.com. 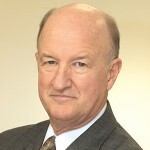 Mark Skousen is a professional economist, university professor, best-selling author, editor of the award-winning Forecasts & Strategies financial newsletter, and producer of FreedomFest, the largest annual gathering of free minds about liberty and freedom in the world. Skousen has been married to wife Jo Ann for 42 years, and has five children and five grandchildren. I have been exploring for a bit for any high quality articles or weblog posts in this kind of area . The US Economy is NOT Slowing Down. Business Spending Soars! 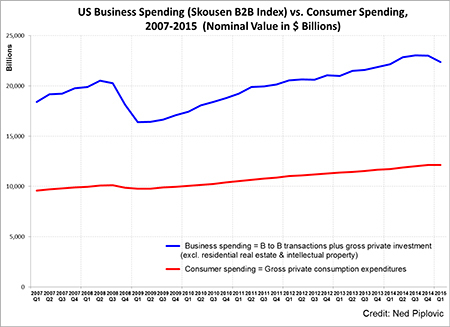 SECOND QUARTER GROSS OUTPUT AND B2B INDEX INCREASE, STILL NO SIGNIFICANT GROWTH OF THE U.S. ECONOMY. Big news: the Bureau of Economic Analysis (BEA) has changed its definition of GDP that starts with Gross Output. Since 1980, Skousen has been editor in chief of Forecasts & Strategies, a popular award-winning investment newsletter. He also is editor of three trading services, Skousen Private Equity Trader; Skousen High-Income Alert and Fast Money Alert. Movie reviews, theater reviews, and commentaries by Jo Ann Skousen, author, editor, professor and Mark's wife of 41 years. She is the Festival Director for the Anthem Libertarian Film Festival and the entertainment editor for Liberty Magazine. Skousen Investor CAFÉ is a weekly electronic newsletter written by Dr. Mark Skousen. Mark offers commentary on the markets, the economy, politics and other topics of interest and what they mean to individual investors. Sign up for FREE here. FreedomFest is an annual festival in Las Vegas where free minds meet to celebrate “great books, great ideas, and great thinkers” in an open-minded society. It is independent, non-partisan, and not affiliated with any organization or think tank. Anthem is the only film festival in the country devoted to promoting libertarian ideals. Anthem shows films and documentaries that celebrate self-reliance, innovation, commerce, individual rights, and the power of persuasion over force. We are looking for the year's best films about personal and civil liberty.